The incident took place near a Ukrainian military checkpoint near the town of Volnovakha on Tuesday, the spokesman for the Interior Ministry in the Donetsk region, Vyacheslav Ambroskin, said. He posted the information on his Facebook page. Initially, 10 people were killed in the shelling. A woman reportedly died in hospital later in the day, according to the Donetsk regional administration which cited health officials. The regional administration also reported that 18 people had been injured. Ambroskin said the checkpoint was shelled from the direction of the town of Dokuchaevsk, which is under the control of local militia forces. 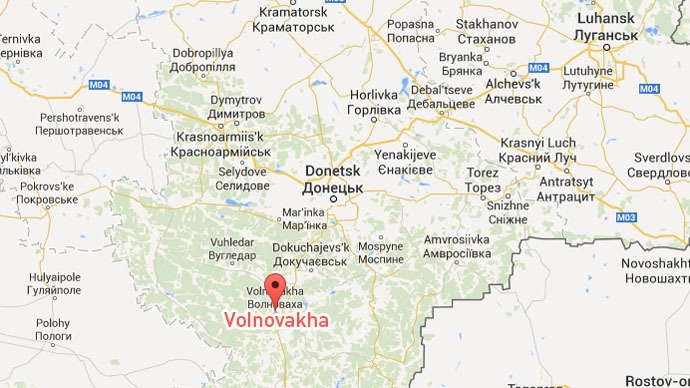 The town of Volnovakha is under Kiev’s control. The site of the shelling was“deep in Kiev-controlled territory”and the Donetsk militia could not have reached it, the spokesman for the DNR People’s Council, Andrey Purgin, told Donetsk media. “We don’t have the capability to shell this checkpoint either from the side of Telmanovo or Elenovka. The Ukrainian side has to figure out what has happened deep in its territory. It’s very far from the contact line,” Purgin said. Denis Pushilin also told RT that the shelling occurred near Volnovakha at a Ukrainian army checkpoint that is "out of the operational range of the artillery of our militia." “I don’t rule out the possibility that [the attack] could be the Ukrainian army’s provocation, to attempt to put the blame for what has happened on local militia,” Pushilin said. He added that according to his data the closest DNR artillery crew was stationed 50 kilometers from the site, which makes it technically impossible for the local militia to have shelled it. The DNR Foreign Ministry called for an independent investigation into the incident in a statement published on its website. “The tragedy took place in the area of Bugas near Volnovakha town. This region is located out of the operational range of artillery and multiple rocket launchers of the DNR army,” the ministry’s statement said. The Chief Monitor of the Organisation for Security and Co-operation in Europe's (OSCE) Special Monitoring Mission to Ukraine, Ambassador Ertugrul Apakan, has called upon all sides to exercise maximum restraint in eastern Ukraine. “Over the past 24 hours the situation has significantly deteriorated, especially near the Donetsk airport; more civilian casualties have been reported elsewhere,” the statement on the OSCE website reads. He also called for a full and immediate ceasefire and the implementation of the Minsk agreement. OSCE representatives met with the DNR officials on Tuesday to discuss the situation in eastern Ukraine, Denis Pushilin told Donetsk media. He said that urgent measures will be taken on Tuesday to properly implement a ceasefire, because without it further talks are impossible. Pushilin reminded that the OSCE mission is located in Donetsk People’s Republic territory is thus has the opportunity to see where the shelling is coming from, and to make proper conclusions. Following several weeks of calm there was hope that peace talks between Kiev and the eastern self-proclaimed republics were bearing fruit. However, after the winter holidays the conflict between local militia and Ukraine’s army stationed in the east has reignited, Donetsk officials say. About 7,500 people were affected after a shell hit a gas pipeline in the Kievsky district of Donetsk on Monday. Over 40 people have been killed and 120 wounded in shelling in the period January 1-12, Russia’s Investigative Committee spokesman Vladimir Markin was quoted as saying by Tass news agency. He said Donetsk and its suburbs were shelled by Grad and Uragan multiple rocket launchers, self-propelled artillery Akatsiya and Gvozdika and other heavy weaponry during this period. Markin said that more than 4,800 people have died in the military operation in eastern Ukraine since the beginning of the conflict last April. Pushilin earlier Tuesday warned that the Ukrainian army could launch an offensive“any second”as troops have been massing near the border of the self-proclaimed republics. He added that the National Guard battalion Sich, stationed in a Donetsk suburb, has been“provoking us with fire,”while the commander of the battalion said he refused to follow Kiev’s orders. Meanwhile, Russian Foreign Minister Sergey Lavrov said Monday that there was information that Kiev forces were getting ready for an assault. "We have rather worrisome information which we are checking right now that Ukrainian law enforcement is getting ready for another attempt to settle problem by force in the near future. It will be a catastrophe," Lavrov said at a meeting with his Latvian counterpart in Moscow.